Four bedrooms, two en-suite shower rooms and one family bathroom. Sleeps seven. 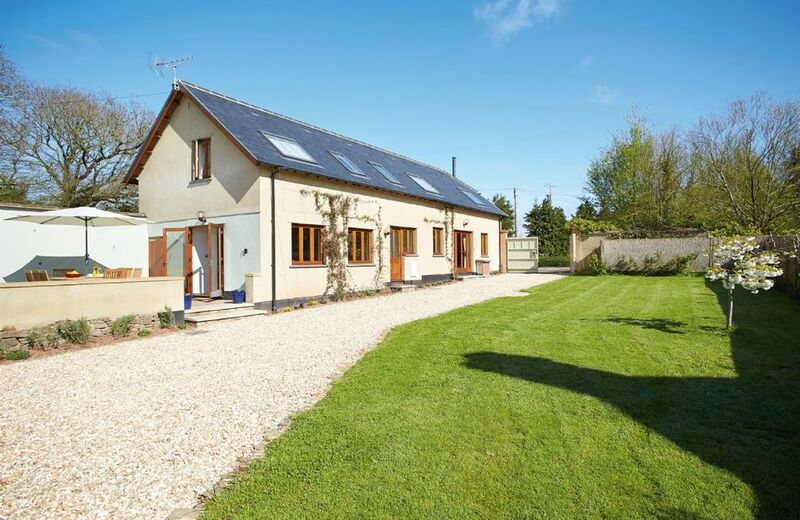 Long Meadow Barn is a charming, spacious, detached converted barn set in the rural village of Down St. Mary. It is the ideal, safe, rural retreat set within its own garden and yet within easy access of Crediton or Exeter. The surrounding countryside is ideal for walking, cycling and golf with Waterbridge Golf Course less than a mile away. The Two Moors Way runs through Down St. Mary as do a variety of public footpaths. Fishing is also available locally. There are numerous local country pubs in the surrounding villages, the nearest being The Devonshire Dumpling half a mile away, a short stroll, which serves excellent food. Copplestone, a mile away, features a general store and post office where provisions can be bought. Crediton is seven miles away where there are Indian restaurants which provide home delivery, Chinese takeaways, a leisure centre with public swimming pool, a large Tesco and a smaller Morrisons. The village of Zeal Monachorum, a couple of miles away, boasts a pub and a small leisure centre that offers an indoor swimming pool, as well as an extensive renowned indoor and outdoor children's play area suitable for all ages which is perfect for those rainy days along with skittles and snooker, all of which will entertain the whole family, as well as good food. Four bedrooms, two en-suite shower rooms and one family bathroom. Fully enclosed garden, safe for children. Minimum of a two night stay, prices quoted for two nights are only as a guide, please do contact the property manager for further details. Gas/electric double oven range cooker. American fridge/freezer, microwave, dishwasher. TVs in kitchen and sitting room, DVD, radio. Cot, travel cot, highchair, stair gate and fireguard are available upon request. A small step from the sitting room into the hall, from the hall to the kitchen and on the upstairs landing. The historic cathedral city of Exeter, five miles away, boasts fantastic shopping and numerous excellent restaurants. Sightseeing tours are available or you can explore the Cathedral, underground passages or visit the Northcott Theatre or cinemas. Dartmoor National Park is approximately 10 miles away with breath-taking scenery where you can walk and explore the countryside and heritage sites. There are also National Trust properties to explore within easy driving distance such as Castle Drogo, Rosemoor and Knighthayes which offer beautiful gardens and an interesting house. From Morchard Road station, half a mile away, the Tarka Line trains run offering lots of walks from a number of stations en-route. Within a short 40 minute drive, there are gorgeous sandy beaches on both the north and south coasts offering sailing, excellent surfing and other water sports. Fishing is available nearby. Golf course and club house less than a mile away. Leisure centre in Crediton incorporating a swimming pool. Smaller leisure centre in Zeal Monachorum (2 miles away) with swimming pool, outside and indoor play area and lots more. Numerous public footpaths incorporating the 3 Moors Way. Exeter is just 15 miles away with superb restaurants, underground tunnels and Cathedral. Bathroom. : toilet, tub, Family bathroom with bath\comma\ hand shower attachment. Two en-suite shower rooms. Family bathroom with bath, hand shower attachment. Oil-fired central heating, gas/electric double oven range cooker. American fridge/freezer, microwave, washing machine, tumble dryer, dishwasher. TVs in kitchen and sitting room, DVD, radio and WiFi*. Cot, travel cot, highchair, stair gate and fireguard are available upon request. Garden furniture and barbecue. *Please note that internet access is offered at this property for recreational purposes only and is not meant for business use. Speed/service may vary depending on the package obtained by the owner which is provided to guests free of charge. Should guests experience difficulties or loss of use, neither the owner nor Rural Retreats will be held responsible. We booked this cottage for a weekend as part of a vacation in Devon and could not have asked for better. The hosts went above and beyond in making us feel welcome and the check in and out process was very convenient. The property was well equipped and was clean, spacious, and well decorated. We did not want to leave! Would certainly stay again.